Happy Monday! How was your weekend? Did you watch the Superbowl? I'm not a football fan (or sports fan, really...), but I did sort of watch it since Josh had it on. Anyway, I hope you had a lovely weekend. We got a gentle dusting of snow and it just made me so happy! Yesterday it was snowing softly almost all day! Audrey loved looking at the window and watching it fall! I LOVE this mascara. I have naturally long, dark lashes, but I still like a good mascara to define and lengthen them even more. Previously, my go-to mascara was Lash Stiletto which I had been using for years....I just never found another one (at any price) that I felt was better....until now! This mascara is amazing. The first thing I noticed was that you need so much less. I used to do many sweeps of mascara with other mascaras I've used (even more expensive ones), but with this mascara, just a couple sweeps gives me the same effect. It even curls my lashes a little bit, which is great, because I do not have time to use an eyelash curler everyday. The end of the wand even has a domed tip that makes it easy to get the lashes at the corners of your eyes. I've had no problems with this clumping or flaking off. It is slightly difficult to remove, but it doesn't really bother me. I highly recommend this mascara! It's about $23. I use this in the color "Radiant" to conceal my under eye circles, I also put it on my lids to brighten them up and even out the color (I don't use eyeshadow everyday). This product just does a great job of concealing and waking up my eye area...something that is truly needed when my little darling wakes at 5am every day! It's creamy, and not cakey, which is key for the eye area so that it doesn't accentuate wrinkles. It's a great deal at about $7. I bought this because I wanted a BB cream, but didn't want to spend a lot of money. I loved the Dr. Jart BB Cream that I sampled in one of my Birchboxes, but I really didn't want to pay $34 for it, so I figured this one was worth a shot at about $8. I use this in the Fair shade, underneath my Tarte tinted moisturizer. This cream is supposed to prime, perfect, hydrate, and correct, and for the most part, I think it delivers. It comes out of the tube as a white lotion with little pigmented "beautifying beads" in it. When I first smoothed it onto my skin, I was surprised to see it transform into a shade that pretty closely matched my skin. You can wear it alone, but I prefer it under my tinted moisturizer. I really makes a huge difference in how my tinted moisturizer performs. My skin just looks more even, less shiny (but not completely matte), and just more finished without adding a heavy layer of additional coverage. I love this and think it's a great product at a great price. I'll definitely continue to use this! My friend Rebekah gave this to me as part of my Christmas gift (so sweet! ), and I love it. It's not something I would have normally bought for myself, but now I will definitely continue to buy it! You can use it on your skin, hair and nails to moisturize, heal and condition. As a bonus, its 100% organic! So far, I've just been using it on my skin and the results have been amazing. I had a breakout area that was unaffected by any other products I had attempted to treat it with, and after dabbing the argan oil on it just before bed one night, I noticed a difference in the morning. My blemishes weren't completely gone, but they were visibly improved. It seems counter-intuitive to put oil on a blemish, but for some reason, it works! I think it's a great product, and a great value, since you can use it in so many different ways, and just a little bit of the oil goes a long way. It's $14 for .5oz. So, tell me....what are some of your favorite beauty products? @Sahar...I think you'll love it! It does run dark in my opinion...the first tube I bought was the "light" shade and was way too dark for my skin. It seemed like it should have been labeled medium. Just an FYI! I've been wanting to try a BB cream for a while now and after noticing my complexion just go to crap in the last month, I decided to bite the bullet after reading your blog yesterday and bought the L'oreal BB cream. It's only the first day, and I'm wearing it alone (no tinted anything) but I like how it smooths out my complexion ever so slightly. Thanks for the tip! Hi Rachel, I've been reading your blog for such a long time now. Thanks for the tip with the BB cream. 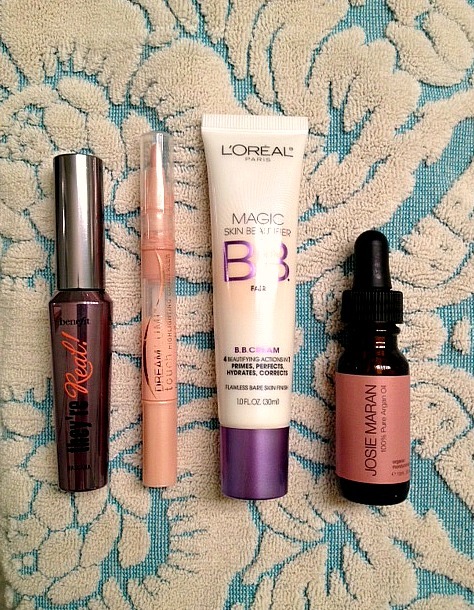 I too have wanting to give a BB cream a try for a while now, and didn't even think about L'Oreal. You don't feel bad buying something that isn't too expensive to try out. I've only used it for a day, but its really nice. Thanks again!